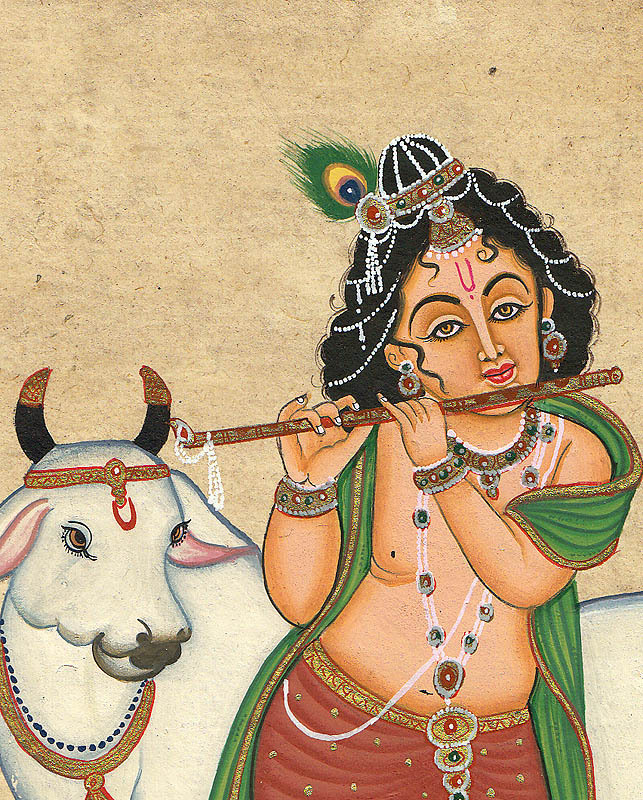 In this painting young Lord Krishna is standing crossed leg in front of his beloved cow. He is about to play the flute and from the face his cute yet naughty behavior clearly spills. He is wearing numerous ornaments from head to toe. A beautiful long necklace is touching almost his waist and a very short necklace of diamonds and stones are adding chivalry to his neck. The white crown of pearls is fixed on his hairs like a dome. Young Krishna is looking bulky because in he used to steal and eat a lot of butter and cream from his village. The cow behind him is also beautiful and her jewellery is pretty calm and soothing. She is even trying to have a glance of the naughty Krishna. Lord Krishna’s eye and lip lining are explicit. Strands of curly hair threading around his right cheek and also the forehead are perfectly done to portray immense texture of his innocence. The peacock feather at the top of his head shows his love for fauna. During Mahabharata war Lord Krishna said that every human must do his work and not just look for results. It is said that when Krishna in any form is present, it automatically generates positive vibes in the surroundings. Although he is wearing a lot of ornaments, yet Krishna’s aura alone is enough for the good of mankind. This description by Abhishek Bhatanagar.